Art for children is the sphere that interests practically all parents who think seriously of their kids' education. It supplies them with useful ideas which will stimulate their children's creative initiative and imagination. 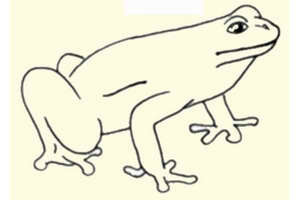 How to draw a Frog — step by step drawing method. It's a nice lesson, let's try drawing. 1. 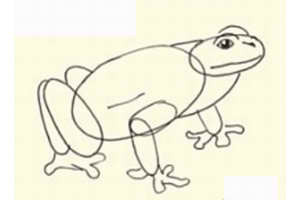 To draw a frog is quite simple! 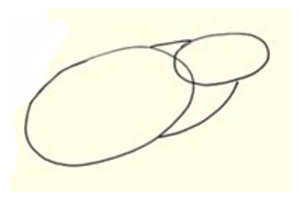 You should start with two ovals: a big one for a body of the frog, the other a bit smaller one — for a head. Then add the lines of the neck. 2. 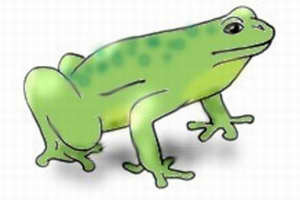 The frog's legs are ovals. Draw them on the legs. 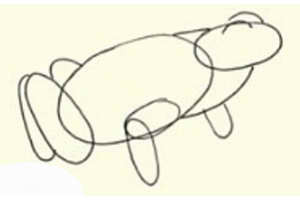 Add two arcs on the head — they'll be the frog's eyes. 3. Now add the frog's paws and fingers. Draw a mouth, eyes and a nose. 4. Then take away some subsidiary lines which are not necessary so that to have a drawing with smooth and clear-cut contour. 5. And the frog is ready! Now you color it in green. Well done!